Art and Mad Science: A Look at John Layman's "Chew"
This search kind of reflects what I've been feeling about my own work. Most of my earlier art all looks the same and looks equally uninspired. This search for comic books is not only for a better variety to read, but also for a better selection of art to study. And since my focus in art is primarily cartooning and character design, what better place to look than at comic books? And that brings me to the topic of this post. 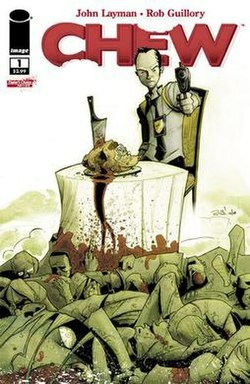 Originally published in 2011, the comic series Chew has apparently been very popular. I don't know much beyond what I've read on Wikipedia about it, but I can't say that I'm surprised that Chew has received several awards. What I like the most about Chew is that it is freakin' weird. Weird art, weird story, weird characters. It's so ridiculously non-standard that it fills my little shriveled ginger heart with joy. When I got this comic book, I was at my local comic shop. We haven't always had a comic book shop that I could get to in a 15 minute drive, so I like to frequent it and throw my hard-earned money at the owner. Whenever I go in, I will ask him if he has any suggestions for comics with unusual or strange art. He has steered me wrong yet. In my most recent visit, he directed me towards this comic. I wasn't too concerned about what they story was like, because the art work itself looked so promising. My local comic book store owner said that it was great and that I would love it, which I do. The story of Chew is amazing. It's weird and wacky and filled with fun plot twists. I won't give away any of the story because I always like to be completely surprised by any story. The art of Chew is equally amazing. I really like Rob Guillory's character designs. They're all unique and stand out against the large cast in the comic. In a lot of comics, I have a hard time trying to figure out the nationality of any particular character. For instance, in any given Marvel comic, an Asian looks practically identical to American. The style in which the characters are drawn is too strict and stylized to really allow an artist to give a character enough features to distinguish one race from another. In Chew, Rob's art is virtually unrestricted. The main character looks Asian, with the set of his eyes and how they are narrowed, and his high hairline. The main character has many traits that we easily associate with 'the good guy.' for one, you can almost always see his eyes. They have a slant to them that indicated Asian, but they also are open and show a lot of emotion. He's also small and unimposing. His body is thin without looking weak. That can kind of be hard to accomplish, since the differences are very slight. Rob makes sure he looks strong by giving him wide shoulders and well defined shoulder muscles. And, to add to the 'good guy' appearance, he has a long and thin neck with a larger head. This makes him look a little goofy and suggests that as a character flaw. And any character with at least one flaw is far easier to idetify with than a perfect chracter. character design. He has all the distinguishing characteristics of being a British gentleman. From his hat, to his pinstriped jacket, to his silly little monacle. I'm not entirely sure of the purpose of this character design, since it doesn't seem to have much impact on the story. All the same, it is a very unique character design that makes this gentleman stand out from every other character in the strip. It's also interestin that Rob made the choice to give him high, sloping shoulders that give the impression that he is not only muscle bound, but also that he has virtually no neck. I find this interesting because this is generally a trait reserved for villians. It gives off the same sort of impression that can lead to a subconscious fear reaction: big guys are generally dangerous guys, as any fan of WWF can probably attest to. Also, the secondary main character generally has shadow hiding his eyes, makng him seem imposing, once again. The monacle that covers his left eye makes it harder for the viewer to identify with him, since the frst thing people will look at will be his eyes. We generally find that we can anticipate what a person is thinking or feeling by looking at their eyes, so by hiding his one eye, it can make us nervous and untrusting of him. I also think it's kind of funny that most of the men in this comic have skinny, thigh-gapped legs. This is one way that an artist can indicate quickly and easily to the viewer that the character is either male or young. Most artists will draw females with thick thighs, especially if it's an attractive woman, or with strongly protruberant hips and thinner legs. Generally, even if a male and female character both have thin legs, a female will be distinguished because her legs will either be crossed, or the won't be set in a wide stance. I really enjoyed reading this comic. Not only was the art great, but the story was great, too. I would definitely recommend this comic book to any cartoonist, character desig/n artist, or any artist looking for an interesting study. I would also recommend this comic to anyone who likes reading strange and off-beat stories. If you're a fan of any of Jhonen Vasquez's work, this will be right up your alley. Happy reading!